Meryl Streep stars as the New York socialite with a great love of music but terrible singing voice. By turns very funny and also with pathos, she is lovingly supported by her husband (Hugh Grant) as she hires Carnegie Hall for her ultimate performance. In the 2010 Florida housing collapse, Dennis Nash is evicted from his home and his family ends up in a seedy motel. Desperate, he soon finds himself working for the man who evicted him, where he has to evict others leading to conflict and anguish in the young man. "Don't get emotional about real estate", he is told, but that's exactly what we do as a strong cast crank up the tension. Filmed in the beautiful but hostile tribal lands of northern Pakistan, this powerful and compelling story tells of how a mother attempts to flee to the mountains with her 10 year old daughter to avoid the girl's impending marriage for 'swahara' - the settling of a blood feud. Waiting to harvest their crop, two Estonian farmers are caught up in the 1992 war in Georgia as it reaches their tiny village. A touching and compassionate anti-war story about people who find themselves caught up in the middle of someone else's conflict. 'Youth' follows Fred Ballinger (played by Michael Caine), a retired maestro, who found fame and was known chiefly for one work. He is asked by the Queen to come out of retirement to perform one more time. It is a look back at life's sprawling possibilities, dark corners and aspirations. Five year old Jack and his Ma are confined to a 10-by-10 foot space where Jack has lived all his life. Despite the oppressiveness, Ma is determined to create a space where Jack can be safe to grow and develop. An Oscar-winning performance by Brie Larson as Ma, who reaches breaking point and embarks on a risky escape. When two mischievous and resourceful young brothers from the slums of Chennai see a pizza shop open nearby, they are determined to taste this magical food. So begins a great adventure, with triumphs and setbacks, as the industrious pair try to raise the cash to fund their dreams. 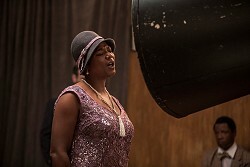 The legendary 1920's and 30's blues singer Bessie Smith's life is laid bare in this moving biopic. From Bessie's childhood to international star, we are taken on a journey in the time of prejudice. Weaving together their lives on and off the track, this exciting documentary follows an all-female racing car team. Set in the male dominated Palestinian world of street car racing they break down barriers imposed by religion and restriction of movement for man in an effort to go faster. A troubled orphan finds himself on the run with his grizzled foster uncle in this unaffected, emotional and funny story from New Zealand.